Wash and dry jalapeño and cilantro. Seed and mince jalapeño. Shave cilantro leaves off the stems; discard the stems and mince the leaves. Transfer beans to a medium bowl and mash with a fork. Add egg, jalapeño, ½ of the cilantro (save the rest for the guacamole), bread crumbs, cumin, salt, and pepper. Mix until well combined. Halve and pit avocado; scoop out the flesh into a medium bowl. Add remaining cilantro, lime juice, salt, and pepper. Mash with a fork until smooth. 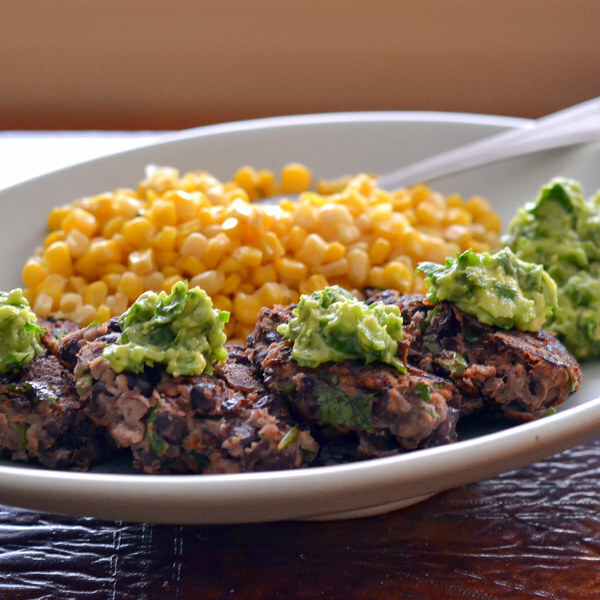 Shape black bean mixture into 6-8 patties and place on a plate. Once corn has been transferred, wipe skillet and coat with more oil. Add patties and cook until browned and crisp, 3-4 minutes per side.